The people of the United States are being deliberately misled and misinformed about the leading role played by the U.S. State Department, intelligence agencies and neoconservative leaders in bringing neo-Nazis to power in Ukraine. 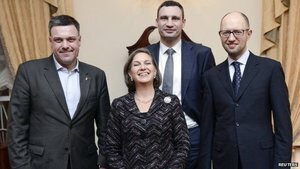 The same neoconservative politicians and strategists that drove the country to war against Iraq in 2003, against Libya in 2011 and nearly against Syria in 2013 have been neck-deep in a protracted regime change effort in Ukraine as part of a larger geo-strategic struggle against Russia. 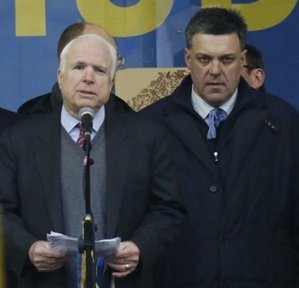 The fact that they have worked hand in glove with armed neo-Nazis in Ukraine—with Sen. John McCain and Assistant Secretary of State Victoria Nuland literally joining the protests—speaks volumes about the political nature of the events. The Maidan protest movement was launched in Kiev in November 2013 when Ukrainian President Yanukovych rejected a European Union economic plan that would have imposed a harsh austerity regime on Ukraine as the price for admission into the economic sphere dominated by German banks. The U.S. and E.U.-backed street protests, supported most fervently by neoconservative elements inside and outside the Obama administration, began when Yanukovych instead accepted a $15 billion loan from Russia and an economic plan that did not require austerity measures but did include discounted prices for Russian natural gas. The U.S. government has engineered, financed and fully supported a classic coup d'état that overthrew a corrupt but democratically elected government in Ukraine. Joining in the destabilization of the Ukrainian government were Germany, France, Britain and other NATO powers. The U.S. State Department funds an international network of non-governmental organizations and media outlets that are used to create political opposition and conduct regime change against targeted countries from Venezuela to Bolivia to Syria to Ukraine and other countries. A principal vehicle for these U.S. operations is the National Endowment for Democracy (NED). The Maidan movement took shape in the form of street protests in November 2013 demanding that the now toppled government of Yanukovych sign onto an agreement that would “integrate” Ukraine into the economic sphere of influence of Germany and the other E.U. countries. The Maidan movement started as a broad-based politically eclectic mix of fascist, centrist and some leftist organizations. The fascist and semi-fascist organizations, specifically the armed wings of the Svoboda Party and Right Sector, became the dominant political force as the protest movement was sustained over several months. Both Svoboda and Right Sector use the iconography of the pro-Nazi Ukrainians who fought with Hitler’s divisions in the invasion of the Soviet Union and carried out massacres of Jews, Poles and communists. After the ouster of Yanukovych, Svoboda Party leaders were appointed to the deputy prime minister position — now held by a notorious anti-woman bigot — and four other ministries. 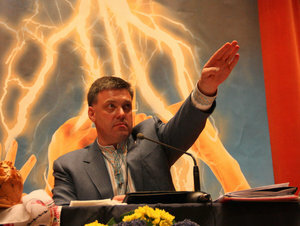 A founder of the Social-National Party, which became Svoboda, is now Secretary of the National Security and Defense Council, which controls Ukraine’s armed forces, and his top deputy is from the Right Sector. The right-wing coup government in Ukraine is trying to integrate the country into an E.U./IMF-sponsored austerity regime that will lead to the deep impoverishment of the Ukrainian working classes. The tremendous resources of Ukraine are seen as a huge prize for the enrichment of the biggest banks and corporations in Western Europe and the United States. These resources include major deposits of coal, iron ore, manganese, nickel and uranium. It holds the largest sulfur and second-largest mercury reserves in the world, and vast, rich agricultural lands and forests. In addition, Ukraine has large-scale heavy industry, particularly in the eastern part of the country. Since the collapse of the Soviet Union most of the former socialist bloc countries of Central and Eastern Europe have been integrated into a NATO and E.U. sphere of influence. Of the 28 member nations of the E.U., 22 so far have been incorporated into NATO. Western imperialism has targeted all the countries in Eastern Europe and the other non-Russian former Soviet republics, including Ukraine, for incorporation into a U.S. and NATO-led sphere of influence. Their strategy is to exploit the land, labor and resources of the targeted countries, while containing and weakening Russia economically and militarily. The Crimean Peninsula was historically an important part of Russia. In 1954, Crimea was transferred as an administrative unit in the Soviet Union from the Russian Republic to Ukraine but both were part of one country – the Soviet Union. The administrative transfer of the Crimea had little significance and no geo-strategic significance until the counter-revolutionary overthrow of the Soviet Union in 1991. Then, all of Ukraine and the Crimea became a primary target for absorption by the U.S. and NATO powers into their sphere of influence. This was a great threat to Russia. The Crimea was the headquarters for the Soviet Black Sea Naval Base which became the Russian Black Sea Naval base after 1991. The imperialist governments of the world have united to denounce and condemn the Russian Federation’s decision to send military forces into the Crimea in the aftermath of the semi-fascist coup that threatens millions of ethnic Russians living in Ukraine and threatens to turn all of Ukraine into a NATO staging ground against Russia. Russia denies that the forces deployed in the Crimea are Russian special forces, suggesting that they are Russian-trained local defense forces working in tandem with Crimea’s established security personnel. Crimea’s governor says he is coordinating with the Russian troops at the Sevastopol base on security matters. Russia today no longer has a socialist government, nor does it operate according to a socialist planned economy based on publicly-owned property. The Russian capitalist class has its own narrow economic interests and the Russian government protects those interests. But Russia is not part of the small club of imperialist countries — the former colonizers of Asia, Africa and Latin America who continue to control the world financial system, hold a preponderance of military and political power in global affairs, and stage interventions and regime change efforts as they please. In fact, Russia is routinely targeted by this Western imperialist club because it functions, due to its size and military power, as an obstacle to their complete hegemonic control over the former Soviet Republics. It also presents itself as a military, economic and diplomatic counter-weight in other critical areas, especially in the Middle East and Asia, not to mention at the United Nations where it maintains a veto within the Security Council. It is completely understandable that Russia would project a show of force in Crimea, not as a premeditated plan of aggression but rather as a defensive counter-move to the dynamic offensive of Western imperialism and the pro-Western, fascist gang that seized the state power in Ukraine. The pro-Russian military presence has been welcomed by huge numbers of people in Ukraine, both in the south and eastern regions of the country, where the coup government lacks legitimacy and is seen as a grave danger. Ukrainian civilians in these areas have been forming their own security blockades defending government buildings and anti-fascist monuments from being attacked by ultra-right nationalists. The presence of the pro-Russian military forces has been a relief to many targeted by the ascending fascist forces. War-mongers like John Kerry and John McCain condemn Russia for “aggression” when it defensively acts to blunt the NATO offensive against Ukraine and Russia. Yet these very figures, and others of their ilk, provoked this crisis. They worked closely with the most disgusting neo-Nazi forces in toppling a democratically-elected government in a large country that exists on Russia’s border. The hypocrisy of their rhetoric is hard to match. These were the cheerleaders for the massive bombing of Libya in 2011, the invasions and occupations of Iraq and Afghanistan and the massive aerial bombing of Yugoslavia in 1999. Yet, today, they feign concern over Ukraine’s sovereignty. No one should be deceived. As for German imperialism, this constitutes the third attempt to forcibly swallow up Ukraine into their sphere of influence. The German army annexed Ukraine from Russia in 1918. Ukraine only regained its sovereignty when the German war effort collapsed in 1918. But 23 years later, Nazi Germany invaded again. Twenty-seven million Soviet citizens died, including millions in Ukraine. Hitler and the German ruling class wanted Ukraine to be transformed into a slave society and colony. Because of Russian, Ukrainian and Soviet heroism, the plans of German imperialism were thwarted. But the prize of incorporating Ukraine into a zone for super-profits for German, U.S. and other imperialist bankers and industrialists has always remained a fixed objective. Washington and its allies have thus far threatened Russia with “sanctions” and “costs.” But economic sanctions are in fact warfare. There is a very real danger that the current crisis could escalate into a military war—a war with unforeseeable consequences—were there to be a U.S.-NATO military intervention. The anti-war movement and all progressive people should stand against any U.S. intervention in Ukraine, refuse to join the U.S.-NATO distortion and propaganda campaign, and demand an immediate end to U.S.-EU support for fascist forces in Ukraine.